CG Says: Lane-departure warning, rear automatic braking, and high-beam assist are now standard on all 2019 Nissan Rogue models, except the base S. Rogue is a compact crossover SUV that seats five passengers. A third-row seat is no longer available. The Rogue Hybrid combines an electric motor with a 2.0-liter engine to produce a total of 176 horsepower; non-hybrid models have a 170-horsepower 2.5-liter four. All Rogues have a CVT transmission and are available with front-wheel drive or all-wheel drive. Available safety features include forward-collision warning and mitigation with pedestrian detection, rear cross-traffic alert, and adaptive cruise control. Other available features include heated steering wheel and hands-free power liftgate. 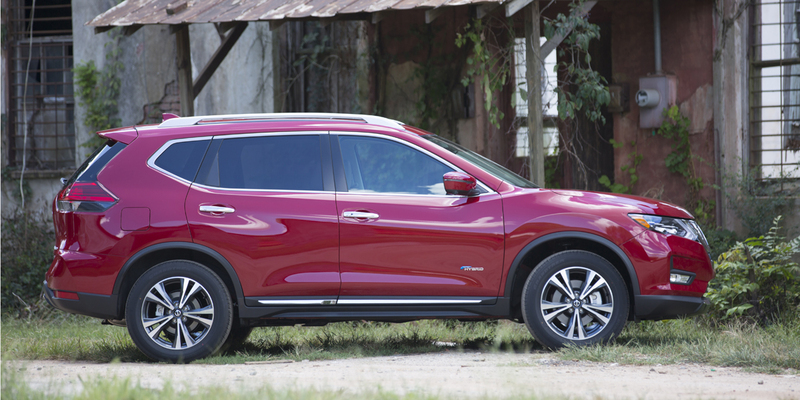 The Nissan Rogue’s numerous enhancements for 2017 made it an even more compelling choice in its highly competitive segment. Plus, the addition of standard Apple CarPlay/Android Auto capability and the availability of Nissan’s ProPILOT “semi-autonomous” driver-assist system for 2018 made it that much more appealing. Rogue’s acceleration is a bit sluggish, but its classy interior trimmings and outstanding cargo versatility rank among the best in its class. The Rogue Hybrid is a fine alternative to the Toyota RAV4 Hybrid and Kia Niro.